FRESH from its triumph at the 2018 Helpmann Awards, practically scooping the pool, winning six Helpmanns for “Bennelong” and a Helpmann for “Our Land People Stories”, Bangarra Dance Theatre again mesmerised Canberra audiences with a brand new work, “Dark Emu”. Taking Bruce Pascoe’s award-winning book “Dark Emu, Black Seeds” as inspiration, choreographers Stephen Page, Daniel Riley and Yolande Brown have fashioned a seamless, endlessly inventive dance work in which the sophisticated farming, fishing and land management practices of Aboriginal and Torres Strait Islanders are depicted in a series of abstract, visually beautiful and passionately danced sequences. 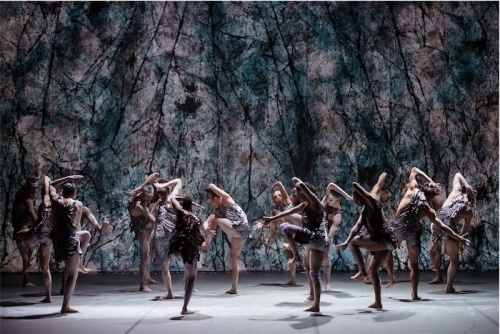 Jacob Nash’s moody setting incorporates huge sculptural interpretations of native seeds and shells, which belch smoke or shower sand on the dancers. Large rocks are carried on and off, structures are built and dismantled in a continuing flow of arresting images, for which Stan James-Holland’s superb lighting, and Steve Francis’s dramatic soundscape, are integral. Jennifer Irwin’s extraordinary muted costumes are remarkable for their incredible use of texture, and the beautiful way they move. Bangarra Dance Theatre has always been an ensemble company with a fiercely distinctive style. The standard of dancing among the 18 members of the current company has never been higher. The confidence and refinement with which the dancers perform the increasingly sophisticated choreographic demands is particularly noticeable in the high polish achieved by the women in the unison sections of the lovely “Bowls of Mourning” sequence. 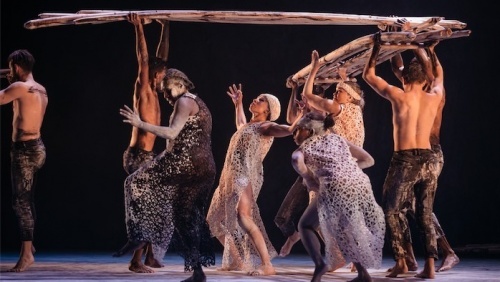 Now approaching its 30th year, Bangarra Dance Theatre is recognised internationally for its particular uniqueness among dance companies. Artistic director Stephen Page has patiently nurtured dancers, Elma Kris, Yolanda Lowatta, Daniel Riley, Beau Dean Riley Smith and Waangenga Blanco into star dancers each possessing a unique presence which imbues any sequence in which they appear with authenticity. Similarly his mentorship of young choreographers such as Daniel Riley and Yolande Brown, and such distinctive creatives as Jacob Nash, Steve Francis and Stan James-Holland, not only insures that Bangarra Dance Theatre will maintain its place at the forefront of indigenous dance companies, but could also find itself scooping the Helpmann pool again with this latest creation, “Dark Emu”.